Antofagasta: are you really pleased to see us? 1. This year, London Mining Network hosted a visit by Lucio Cuenca, Director of Observatorio Latinoamericano de Conflictos Ambientales, (OLCA, the Latin American Observatory of Environmental Conflicts), who came to the AGM with us. 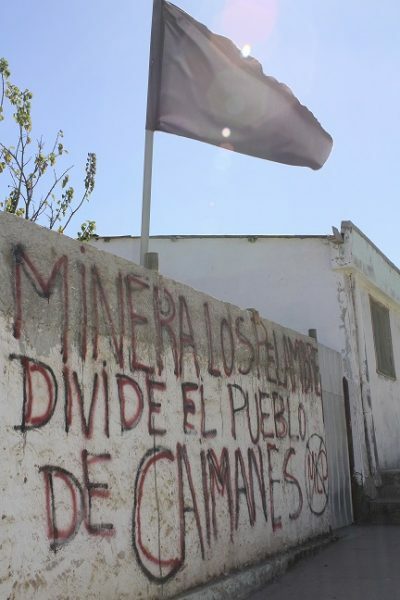 Two days before the meeting, we published a short report about Antofagasta subsidiary Minera Los Pelambres and its impacts on the community of Caimanes. I got the impression that company management was not too thrilled with this report. 2. Just before the meeting began, a woman from the company’s Public Relations company, Brunswick, greeted me and said that they acted for a number of mining companies and would “like to have a coffee” with me some time. I can’t think why. 3. Chairman Jean Paul Luksic began by saying that the meeting could begin because the quorum for a valid meeting is three members present in person or by proxy and able to vote. Our delegation of four could have provided the quorum ourselves! Given that two members of the Luksic family sit on the board, and their mother – the richest woman in Chile – was also present, they also could have constituted a forum and held a valid AGM. Such a small quorum surely militates against accountability, and is one of the very many things that needs to change in British regulation of companies incorporated in the UK or listed on the London Stock Exchange. 4. Jean Paul Luksic then offered the company’s condolences to the families of those murdered in the bombing in Manchester a few days previously. 5. He drew attention to the fact that Francisco Veloso, Chairman of Minera Los Pelambres, was present. We knew that, because Mr Veloso had already greeted us in a friendly manner; and before that, he had emailed us to say he was not happy about the report we had just published. Well, you can’t please everyone. 6. Jean Paul Luksic then spoke about changes to the board of Antofagasta plc. Francisca Castro, an expert in mining energy and finance, had joined. Viviane Blanlot was now Chair of the Sustainability and Stakeholder Management Committee. 7. Much of the Chairman’s address was about financial and technical matters which I did not note. But a few points caught my attention. 8. He said, as mining company chairmen usually do say now, that the safety of the company’s employees and of the communities in which they work is their number one priority. If that is indeed the case, I wonder why they have resisted dismantling the enormous El Mauro tailings dam above the small town of Caimanes and have not enabled the town’s inhabitants to move to a safer site. He said that during 2016 there had been two worker fatalities, one at the company’s railways division and the other at the new Antocoya mine. On behalf of the board, the company’s employees and himself, he offered condolences to the families involved. The company’s target is to achieve zero fatalities. 9. He mentioned that new thickeners are now in use at the Centinela mine. These can reduce water use and the area needed for tailings disposal. 11. He said that the company is “taking steps to implement a cultural reinforcement process.” What that is I have no idea. But apparently it involves increasing opportunities for female employees. 12. He said that the company’s mines at Los Pelambres and Centinela have very large resources and will be the core of the company’s growth for many years to come. The next development at Minera Los Pelambres is incremental expansion. The company finalised the feasibility study in March this year. They are developing a desalination plant to complement ‘continental water’. There is a new concentrator line at Los Pelambres. This will add 55,000 tonnes of copper to annual production, bringing total production to over 400,000 tonnes per year. 14. He finished by noting that 2017 is an election year in Chile. Regardless of the outcome, he said, the copper industry has a vital role to play. Perhaps if he were to take into account the information which Lucio Cuenca had presented at a public meeting the evening before, he would have been less bullish about the industry. It provides relatively few jobs while producing enormous quantities of waste. He accepted that “Chile needs to diversify its economy” but said that it should “not lose sight of the very important role that the copper industry has to play.” He said that the country has 30% of global copper reserves and, if managed properly, copper has a long term role to play in Chile’s development. 15. As Antofagasta plc’s Chief Executive Officer does not sit on the company’s board, unlike in other large London-listed mining companies, we were spared a second long speech. 16. The resolutions were then formally proposed and a poll opened that was to remain open until noon (by this time it was shortly before 10.30). 17. The Chairman invited questions. 18. One shareholder asked when the company expected to recoup its investment in the Zaldivar project. Jean Paul Luksic answered that Antofagasta owns 50% of Zaldivar and that it is a mine with good potential for growth. Production this year is up on the previous year. It is just breaking even on current copper prices. The price of copper determines when Antofagasta will see returns on its investment but a logical long-term price of $3 would make it profitable. 19. Rebecca Warren, from ShareAction, said: “Nobody has yet mentioned climate change, so I will. As you know very well, climate change risk is a key priority, particularly for companies in energy intensive industries, because it causes significant business risks, and also because of the importance to your stakeholders that you address sustainability and ethical concerns. 20. “Two years ago I asked at the AGM: As Chile has committed to reducing greenhouse gas emissions by 20% by 2020, will you formalise Antofagasta’s own effort to tackle climate change by establishing targets for emissions reduction in line with Chile’s national target? At the time you acknowledged the need for a target, but were not prepared to make a commitment. So I committed to follow up. 21. “Now it is 2017, and I am here again. I was hoping to see your 2016 sustainability report before, or at, this meeting – I even came early today so I would have time to look at it – but it is currently available only in Spanish, which I do not speak. 23. Jean Paul Luksic said that this was an issue that had been highly debated inside the company. There were plenty of reasons why it had not yet been able to set a target, though the company was now getting very close to it. One of the main problems had been its energy providers. The Chilean grid provides hydro, coal and oil generated electricity. That is a challenge in trying to calculate the dimensions of the company’s carbon footprint. But as a company, over the last four years Antofagasta had been helping investments in renewable energies. As part of its drive to gain access to cleaner energy, it had been working with others on renewable projects including wind farms and photovoltaic energy projects. So, the company had taken steps, and the next step is to set targets. 25. “Faced with the eventual new expansion of Minera Los Pelambres, which includes expanding the El Mauro tailings dam, I would like to ask the following question to the board. 26. “MLP has a built up a long list of conflicts with the communities of the Choapa Valley due to the environmental and social impact its caused, including the destruction of territory and of social fabric. 1) Recurrent ruptures of the pipeline resulting in toxic spills to watercourses and soils. For example, in 2015 it broke on two opportunities in only a few months. 2) The severe water crisis caused by MLP mining operations, which operate with fresh water at the top of the basin, preventing access to quality or enough water for the communities located downstream. 3) Destruction of Rock Glaciers, in the context of climate change, according to a report by the University of Waterloo (Brening, 2008). 4) The previous tailings dam, Quillayes, remains a permanent focus of contamination of water sources due to leaks, of air by emanations of toxic dust, and of fear of the risk of collapse on the community of Cuncumén neighboring this operation. 5) And last year the Superintendency of the Environment opened a new process of sanctions to the company, citing nine charges for environmental infractions accumulated in recent years, which demonstrate that MLP does not respect the Environmental Qualification Resolution. The sanctions have been categorized into five serious and four minor charges, that is to say that these charges could lead either to multi-million pound fines or to the cancellation of the mine’s environmental licence. This does not inform the Board today. 28. “However, the project is still active. Creating around it, not a network of good practices, but a network of influences that guarantee impunity: bribery, co-optation, corruption. 31. Regarding conflict with the community in the Choapa valley, the Chairman said that it was true that there had been “some moments of difficult relations with the community” but the company had “made enormous efforts to improve relations with the valley”. It had set up meetings with communities in the Choapa valley and had addressed with them the environmental and social impacts of the mine. During the last year the company had finally reached agreement in all the court cases in which Minera Los Pelambres had been involved, and the company was very proud of the agreement reached with the community with the supervision of government as well as the courts to get a solution to the problems raised by the communities. Regarding the Mauro crisis or the water crisis, the Chairman wished to “be very clear, it is not fair to blame the company for one of the longest droughts which Chile has experienced in its history,” between five and seven years. This had created a large water need. At the same time, Minera Los Pelambres was active in helping communities to develop water assistance through additional water stations. Today the company feels it has helped the community during a very difficult period, and since 2015 the rainfall has come back to normal in the area and the water crisis should end. 33. Lucio pointed out that extracting water in an illegal manner in a valley in the north of Chile is a serious matter. Regardless of whether seventeen cases have been resolved, to extract water illegally and without doing enough to control the quality of available water and not to be transparent in the extraction of water is a serious issue. Lucio accepted that there was a drought, but during the whole period of drought Minera Los Pelambres had never run out of water, whereas people in neighbouring communities did run out of water and did not have access to fresh water. 34. Lucio said that it was also serious that the agreements which the company had concluded with communities had been pursued under great pressure. The way in which the company had come to these agreements had been part of a process of fundamentally altering people’s way of life, and the agreements had been reached primarily through exerting huge pressure on communities and also on the authorities whose task is to control and regulate the company’s operations. This influence could be evidenced through irregular payments made to the President of the Congressional Commission on Mining and also by the way in which the company had managed to get the Ministry of Mining to release a report produced by the company as if it were a report by the ministry. 35. Jean Paul Luksic replied that he disagreed with Lucio’s opinion and his analysis of the situation of the company in the Choapa valley. The company does not do illegal extraction of water: it has its own water rights [facilitated, of course, by the fact that in Chile water has been completely privatised, and people’s human right to water as a necessity for life is not legally recognised] and the company is closely monitored by the authorities. The company had helped the communities to have water during this difficult period and it was discussed with them and agreed with them that it would be helpful for them to have the company’s help in this way, and the authorities agreed it would be a good gesture from the company to help the communities. The company has had strong differences with parts of the community at Caimanes, and it is very hard to have 100% of any community supporting a project or a solution for the community, but 83% of the community voted in favour of the “final solution” for all these disputes. This was a great recognition by the majority of the community that this was a sensible solution to the long-standing dispute between the community and the company, and the authorities were happy to see this coming to a reasonable end. 37. It is possible that I misheard the Chairman, but I am fairly confident that I heard him use the words “as soon as…” followed closely by “a few months later”. There seems to be an inconsistency there. 38. Another shareholder said she had had no questions at the beginning of the AGM but now had five. “All relate to your cost base, which affects my dividend and your profitability,” she said. (1) Had the company tried employing women to drive trucks? BHP Billiton finds they save money. (2) The company had been cutting costs a lot – how much more could it do so before it affected expansion? (3) Diversification – many mining companies try going overseas or into a new commodity. Molybdenum had done well: would the company expand production? Would it expand into Argentina and Peru or is it politically difficult? (4) What is the inflation rate in Chile? This has an effect on costs. (5) Was there anything in the accounts (which she had not yet had time to read, she said) regarding the costs of legal disputes? Had any provision been made for these? 39. Jean Paul Luksic replied that Antofagasta had been one of the first companies to have a programme to prepare women to work in its operations. It was probably the first company to develop a strong programme to attract female talent. It had prepared a lot of women to drive trucks and was unfortunately losing them to other companies very quickly, but it was happy to bring that talent into the company at the operations level and on the board. The company also had a strong cost-cutting programme. Expansions were managed separately. It is necessary to sequence the different expansions of the company. As mentioned earlier, there were expansion projects at Los Pelambres and Centinela. The company wants to make sure that one is happening before the other and that the company is not doing two at a time. It will go through a process of very careful planning. It is capable of doing these projects but also at the moment it needs to “be conscious that the world is full of surprises.” It is confident about copper but it is appropriate to be conservative at the moment. On molybdenum development, the company would be finishing the molybdenum plant for Centinela (where this metal is a byproduct) but nothing more than that. Regarding going into other countries, there are possibilities, mainly in the Americas. Peru, Canada and the US are the most appealing and are priorities compared to others, but the company will keep eye on opportunities. The Chilean inflation rate is 2.5 to 3%. And yes, the company had made provision for Pelambres for the costs of legal actions. 40. I then asked a question about conflict at Caimanes. I said: “At last year’s AGM, you reported on the agreement between Minera Los Pelambres and some of the members of the community at Caimanes who had brought one of the many law suits against the company. However, it appears that this agreement has not solved the conflict. There is concern that the amount of money each family will receive will not be sufficient for them to move and enjoy the standard of living they enjoyed before. 41. “I am informed that there is a renewed resistance from those who did not sign the agreement – over 100 people – and that there are new legal proceedings against the law firm Ossa and Company, which represented many of the community members and which encouraged its clients to accept the agreement signed in April of last year. Serious questions have been raised about the morality of the payment by Minera Los Pelambres of 3,100 million Chilean pesos, around 3.5 million pounds sterling, to Ossa and Company. Despite the fact that over 100 people have not signed the agreement, the payment led the lawyers to desist from the legal proceedings of the community against the company. 42. “The payment to the community’s lawyers has generated legal proceedings by part of the community against their former lawyers. These new legal proceedings have already been declared admissible by the Chilean judiciary and, if they were successful, they could result in the annulment of the agreement. 43. “According to a report posted on Chilean news website The Clinic on 2 May, the proceedings currently being brought against Ossa and Company may at some stage be broadened to include Minera Los Pelambres and its owners. 45. Jean Paul Luksic replied that this was an issue that had involved the company for a long time. There had been plenty of different court cases against Minera Los Pelambres. He went on, “The new court case is by my understanding a court case by thirteen people who hired a lawyer and are suing Mr Ossa, so this will not have an impact on the company. Our understanding is that the vast majority of the community, 84%, signed and voted in favour of an overall agreement where we would solve all the outstanding court cases with the supervision of court and government. We feel we have a very solid base for this agreement in terms of community support.” Regarding the payment to Ossa and Company, he said that the community had wanted to pay Mr Ossa for his services, and the amount paid was the amount which the community, the company and the authorities agreed was the right amount. Does the board know what’s happening on the ground? 47. Jean Paul Luksic said he felt strongly about the way the company is structured. He said it has a strong executive team with the CEO as the leader, and the CEO comes to the board and makes presentations and gets all the approvals he needs from the board to continue to operate. The board does not see a need for the CEO or Finance Director to be members of the board in order to make up for any supposed lack of information. He said that in his view it was a good system. 50. Lucio said that environmental charges laid against the company had referred to seven wells drilled illegally around the Quillayes and El Chinche tailings dams to extract water. 51. Lucio said that the Chairman had said that Mr Insunza had not received money from the company when he was a member of parliament, but a year later he was receiving funds, and he had received funds in previous years as well. During the time when he was on the company’s payroll, he had blocked important reforms, including reform of the water code. 53. Jean Paul Luksic said that Lucio was wrong in saying that the report had been falsified. This was not the case. What was the case was that the company’s lawyer had asked the authorities to give the company a draft report saying that the company had acted in good faith when it received all its permits to dump waste on its own property, and later the company had learnt that the two national governments had changed the border; so Jean Paul Luksic disagreed with Lucio’s statement. Regarding Mr Insunza, the company had paid him for around seven months before it cancelled its subscription to his report, and Mr Luksic said that the company should have done this sooner. The Chairman then asked Francisco Veloso, Chairman of Minera Los Pelambres, to respond to the point about the seven wells. 54. Francisco Veloso said that Lucio was right that there are charges over these seven wells. The water authority had approved their construction but the environmental authority had said that they were not in the description of the Quillayes dam, so the company had presented to the authorities a compliance plan, which is under review, and the effect of the plan would be that the company should be able to comply, and the fines had been suspended against Minera Los Pelambres, which wants to fulfil all its obligations. 55. There was a confusion in the translation at this point: the translation that Lucio received was that the wells were constructed by the water authorities. Lucio therefore said that this was an inadequate response: it was unacceptable to blame other authorities for something which was the responsibility of the company. 56. More might have been said, but delays in translation between English and Spanish meant that Lucio was unable to respond further to Mr Veloso. 57. Jean Paul Luksic closed the meeting, saying that he looked forward to seeing us all again next year. I find that very difficult to believe: I am sure he would much prefer that some of us found other things to do next year. 58. Immediately after the close of the meeting, we were approached by Francisco Veloso and then by company CEO Ivan Arriagada, and an animated discussion took place. The central disagreement was that developments which we see as tragic – for instance, loss of traditional livelihoods, cultural changes forced upon people though circumstances, and irreparable damage to cherished landscapes – appear to company officials to offer opportunities for ‘improved social capital’. Mr Arriagada appeared to be rather cross when he began and to become steadily crosser as the conversation with Lucio continued. I expect his job is terribly stressful; though not, perhaps, as stressful as losing one’s livelihood, seeing one’s formerly close community divided and ill at ease, and living beneath the highest tailings dam in Latin America, in an area prone to massive earthquakes. For other news of the AGM, LMN’s report and the issues, see For how long will the London Stock Exchange give Antofagasta mine a free pass? Antofagasta: is it hiding something?